It's that time again! I've been having so much fun with my new camera lens and droid instagram app that I decided to join in on August Break 2012. Many of you may remember this from a few years ago, but for those who don't, August Break is a one-month challenge created by Susannah Conway that encourages us to stop and capture moments around us through the camera lens. 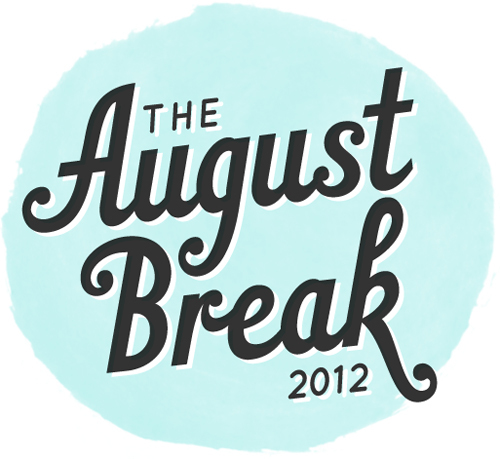 These images are then shared through the August Break Flickr page or by using #Augustbreak on instagram. If you have a camera phone, or want to get more practice with photography, I encourage you to join in. It all starts tomorrow, so stay tuned! Until then...here is a list of my favorite things about August. 1. So many fruits and veggies are in season this month. It makes me excited for rich flavors, new recipes, and thoughtful inspired cooking. 2. It's when I start dreaming about fall. The weather is still warm and I still long to be outside, but in my mind I am daydreaming of cozy sweaters and boots and craving Thanksgiving dinner. It's nice to have something so delicious and holidays to look forward to. 3. It's Panini Month, Happiness Happens month, and Audio Appreciation month, and I love me some happiness, music, and paninis. Not necessarily together, but that would be pretty great too! 4. It is one of the 7 months of the year that has 31 days, which means one more day of summer! 5. It's the month before my birthday and I get to start my wish list! This book, this book, and this item are definitely in the mix. And I think I may need one of these or one of these. What do you love about this lovely summer month?